$195. 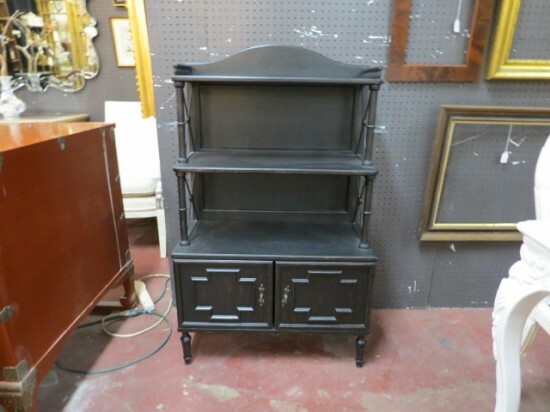 Vintage bookcase cabinet by Drexel. Established in 1903, Drexel is a leader in transitional and modern furniture. 3 shelves, two with x base sides. Top has gallery sides and a rounded back. Sits on top of a 2 door cabinet with a molding design. Original matte black factory paint. Perfect for your entry, living room, dining room or bedroom. Can fit almost anywhere. Excellent condition. 27.5in wide, 14in deep, 46in tall.